Who is Golden Horseshoe Chorus? 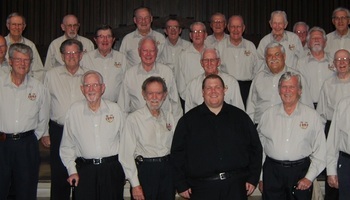 Golden Horseshoe Chorus is a community-based, not-for-profit organization providing recreational daytime singing opportunitiesfor men and women, without restriction. Although the chorus performs occasionally at ticketed events, we perform most frequently in retirement residences and at community events throughout our region. Our membership runs September through August. We rehearse every Thursday at 9:45 for the ladies and 12:45 for the men at St Matthews on the Plains, 126 Plains Road East, Burlington, Ontario. Want Golden Horseshoe Chorus to sing at your next function? 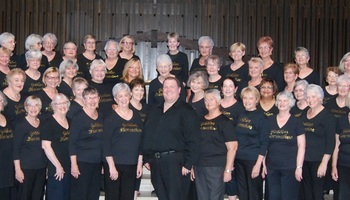 Why not hire Golden Horseshoe Chorus to entertain at your next event? We can perform at corporate functions, charity events, community Entertainment events, birthday parties, christmas parties, awards nights, weddings, engagements, anniversaries, engagements, and even funerals and memorial services.